Become a Preferred Customer & Save! 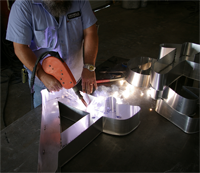 Here at Daniels, Wholesale Manufacturer of outdoor and indoor lighted signs, all letters are precision crafted, completely welded, and painted per your specifications. 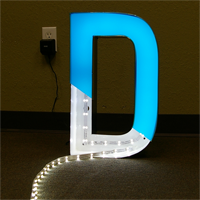 Wholesale channel letters are available with or with out Neon or LEDs. 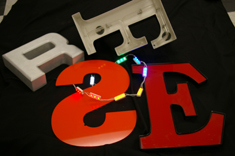 All letters are wired with UL or ETL approved components. 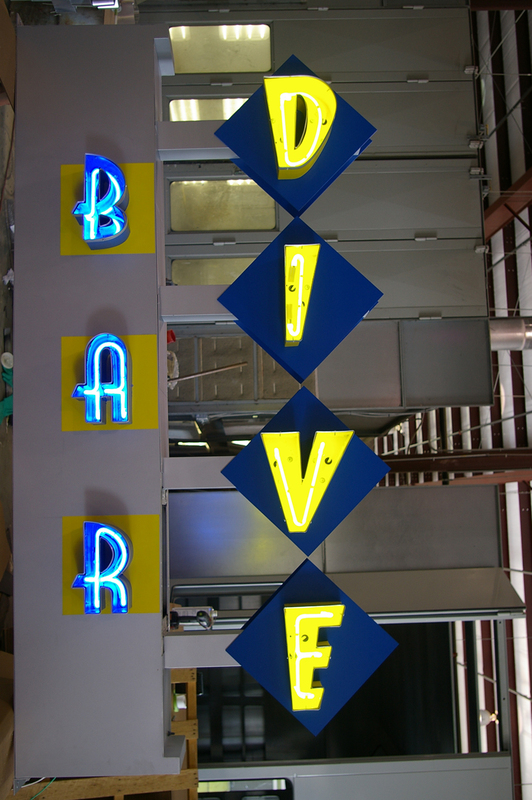 We make custom wholesale neon or LED illuminated channel letters to your specifications. 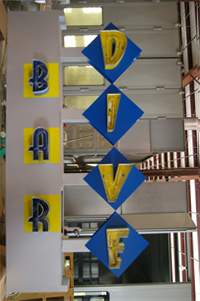 Open face channel letters or Reverse Channel Letters. You will provide us the neon pattern or email us the artwork, and we'll make the pattern and the neon. Your satisfaction is guaranteed. We are here to accomodate your style and needs. Our expertise and knowledge are always on hand to assist you in making informed decisions about color, lighting, construction and design selections. Letter sizes from ten inches (can be smaller depending on stroke width) up to six feet. 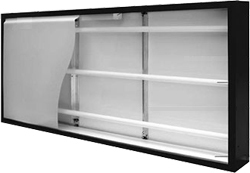 For larger sizes please contact us or see custom cabinets. 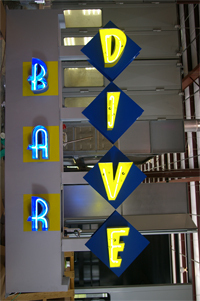 LED Illuminated Channel Letters are energy efficient, low voltage, and low maintenance compared to Neon Illuminated ones. The lightweight design of an LED module virtually eliminates breakage. 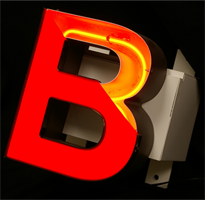 LED Channel Letters provide the opportunity to create savings over a long period of time. Initial cost of this product can be a little higher than neon illuminated letters depending on the color. Red is typically least expensive. 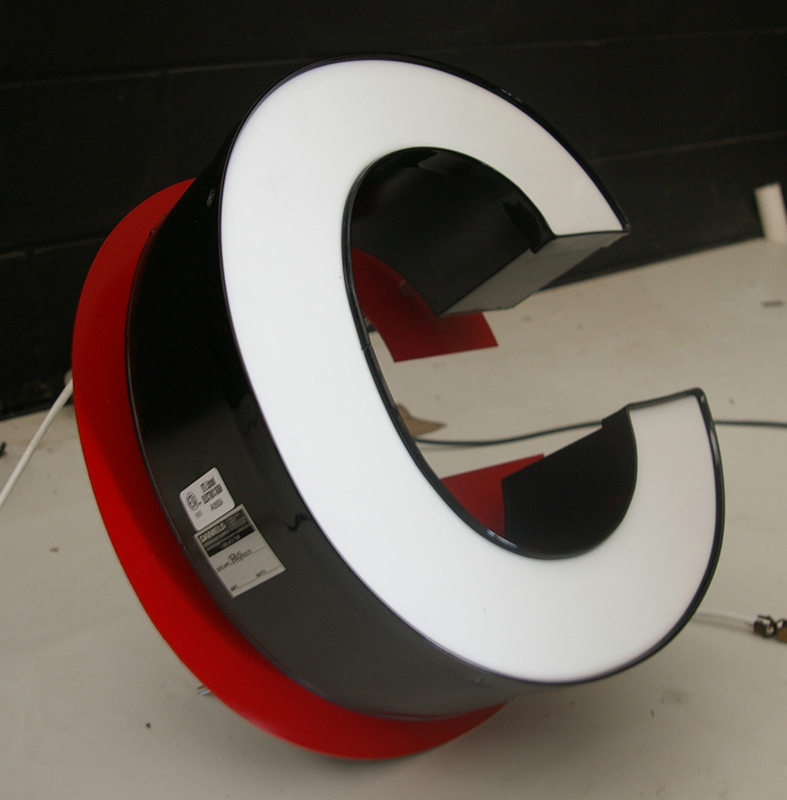 Channel Letters are a highly effective form of advertisement and can be shaped to any letterstyle or logo. Historically, all channel letters were neon illimunated. However, emergence and decreasing price of LEDs gaining more and more ground versus Neon. When illuminated with neon this product is highly visible at night. A properly designed channel letter sign can effectively communicate your message for many years. Note: Channel letter stroke over 5", should use double row of neon. Channel Letter with Single Row neon. Red cap, black trim and black return. Contour Channel Signs (also known as Logo Boxes) are a great way to express your custom sign and still get the look of a channel letter. They also can be shaped to any contoured letterstyle or logo. This type of channel sign provides opportunity for creativity with vinyl and digital prints. Countour Channel Logo Box a.k.a. Custom Logo Box Cabinet. Custom Logo signs can be manufactured to any shape, including standard shapes, symbols and business logos. Possibilities are virtually limitless for Custom Logos. If you can dream it, we can make it. 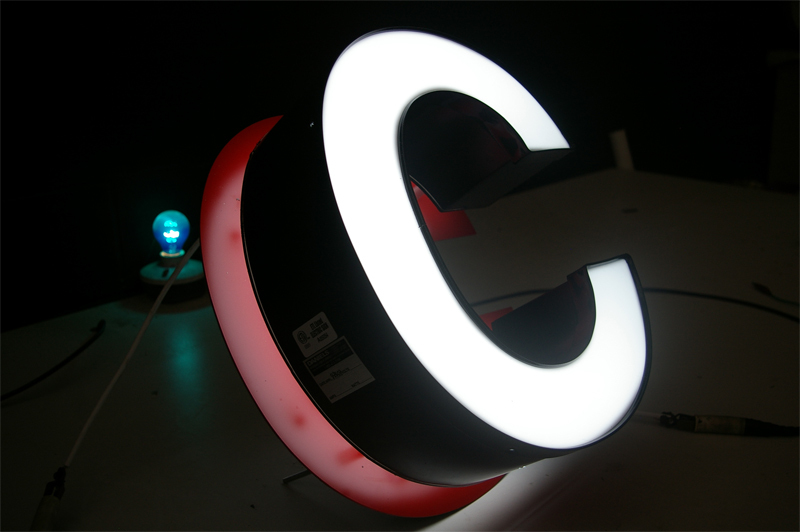 As long as we can fit your illumination of choice in the product, it can be manufactured. Custom Logo Box Cabinet "Dickies"
Front & Back Illuminated Channel Letters are constructed to provide not only a front illuminated channel letter but also a reverse "halo" effect. 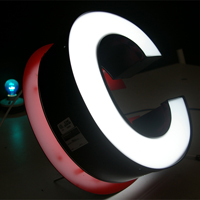 This product can be assembled using one or two colors of illumination. Welded Channel Letter Can: In regular block channel letters, aluminum backs are routered out of aluminum list. Then to give it a 3-D look, returns (wall of channel letter) are hand-molded and welded with high accuracy to the aluminum backs. Inner wall of resulting can is painted white and outside is painted per client's request. 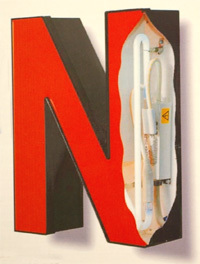 Notched Channel Letter Can: Mostly used in mass produced channel letters or jobs with large number of sets. Each part is produced with the same accuracy as the last, this enables replacement parts to be manufactured with the same precision as the original. 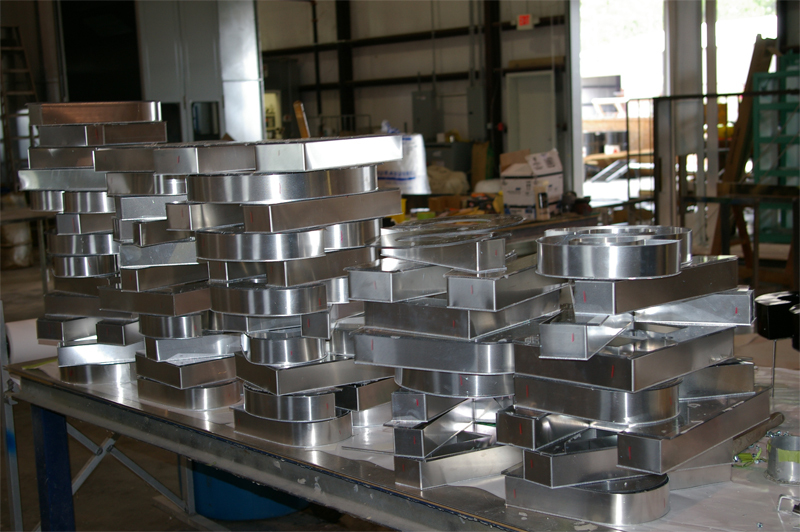 Returns are precision bent from prefinished aluminum strips, and notched to aluminum back face. 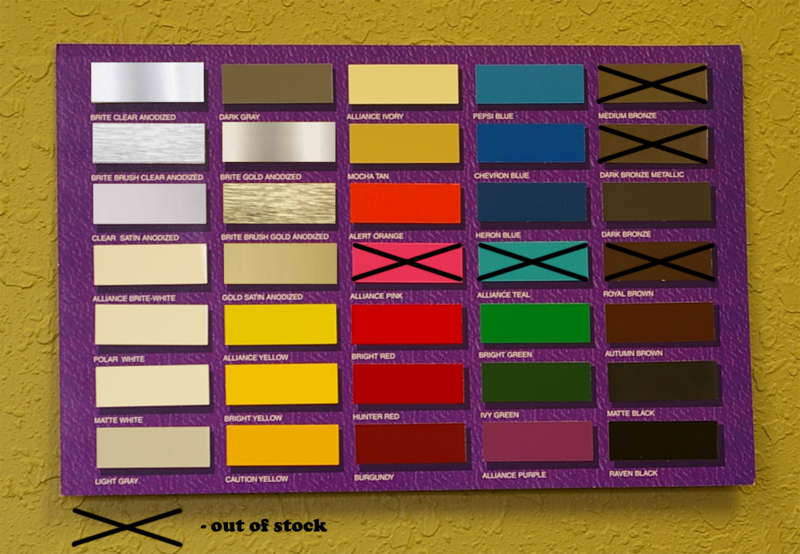 For prefinished return color chart, CLICK HERE. Letters on a raceway have common wiring and ballasts which run through one or more common raceways. Although initially a little more expensive, the buyer recognizes large savings in installation, maintenance and initial wiring. 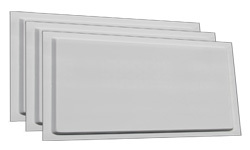 Note: Letters mounted directly to the wall will be provided with mounting holes and a pattern unless otherwise specified. Note: Stroke width cannot be less than 1.5 inches. We offer very competitive turn around times in the industry. Each job is unique and custom. Call us for details with your job specifications. In a bind? Use our JetService. © 2008 Daniels Wholesale Sign & Plastics, Inc. All Rights Reserved.